Touring homes is something I really enjoy, especially those old historic charmers. While in Georgetown, SC this past weekend for a Plantation Tour, we learned the beautiful Chicora Wood Plantation is on the market. I wanted to share it with you just in case you may be searching for an old historic charmer for yourself. A little about Chicora Wood, A Plantation Preserved. 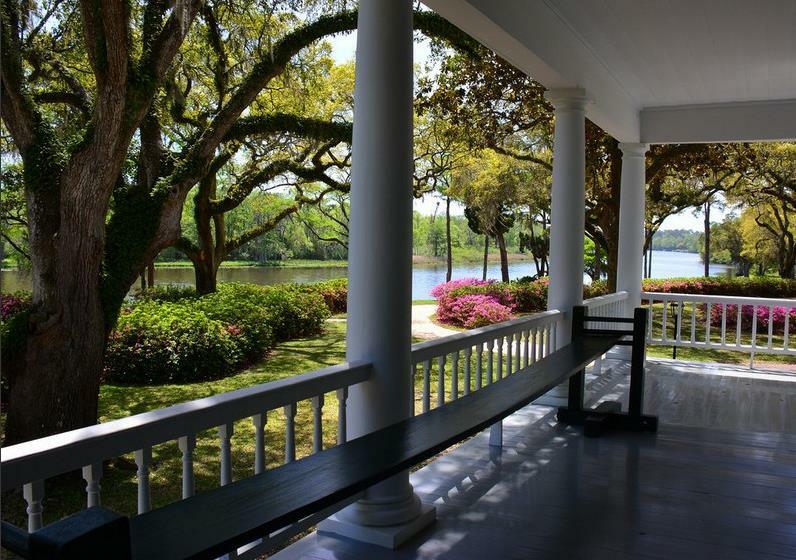 Sitting among magnificent moss-draped ancient oak trees and beautiful formal plantings, this graceful antebellum manor house commands a mile of riverfront on the Pee Dee River. It is no exaggeration to call Chicora Wood Plantation one of the most successful rice plantations in South Carolina of its time. In 1850 it was home-base for Gov. Robert F. Allston, who owned a network of 7 plantations along the river. His holdings produced more than 1.5 million pounds of rice in a year's time. The live oaks have ferns growing on the limbs and are draped with moss. This side view shows the back extension of the house. 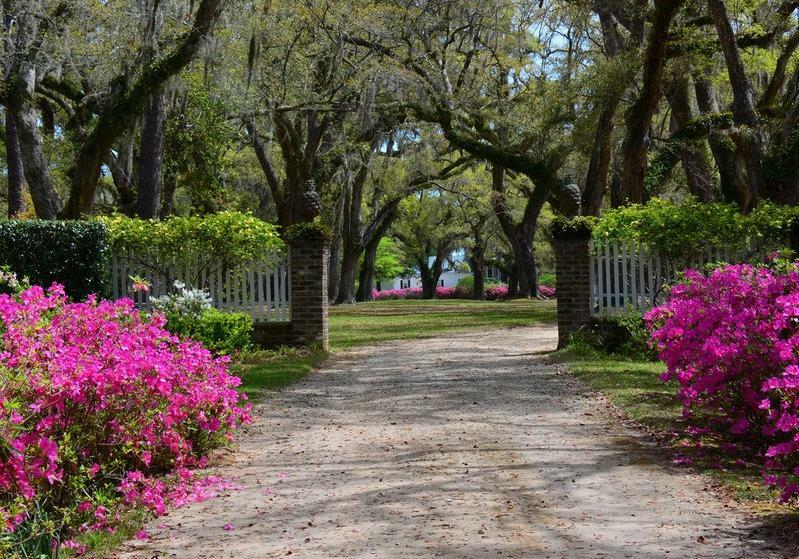 Chicora Wood Plantation consists of approximately 1,000 acres of managed formal grounds, turf farm and ricefields. 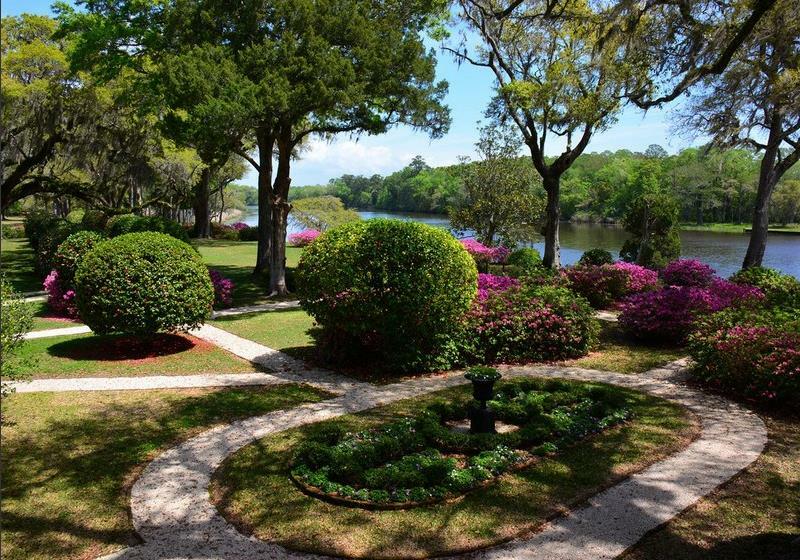 The property extends roughly 350 acres across the river. There are two additional residences on the grounds. The former school house is a 3 bedroom, 2 bath guest quarters that overlook the river and tennis court. 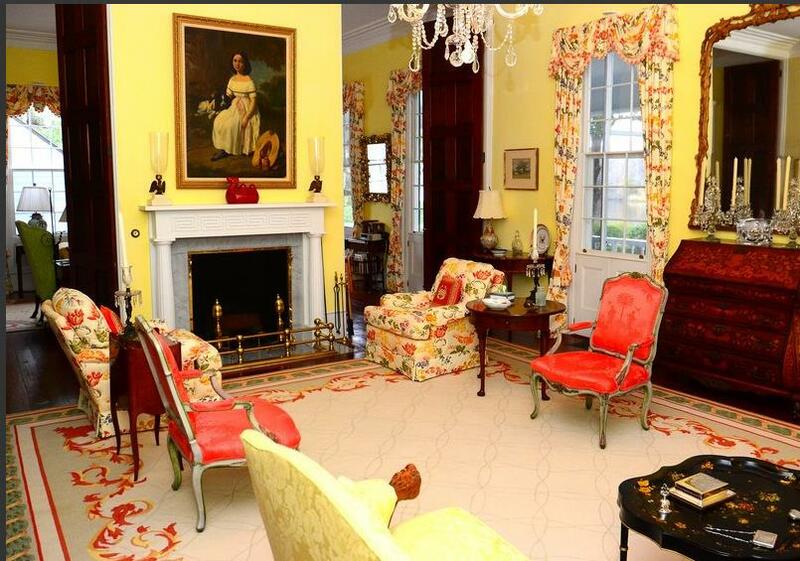 Also the caretaker’s house is a 3 bedroom, 2 bath dwelling with views of the formal garden and river. There are 8 dependencies on the property: the Summer Kitchen, Smokehouse, Driver’s House, Carriage House, Rice Threshing Mill, Shipping Barn, Gatekeeper's Cabin and School House. All have been restored to their time period with the utmost care. There are also numerous equipment barns, and caretaker’s office. This turnkey working plantation is the perfect niche for owning a piece of the past. Over 100 acres of impounded former ricefields afford bountiful hunting opportunities. 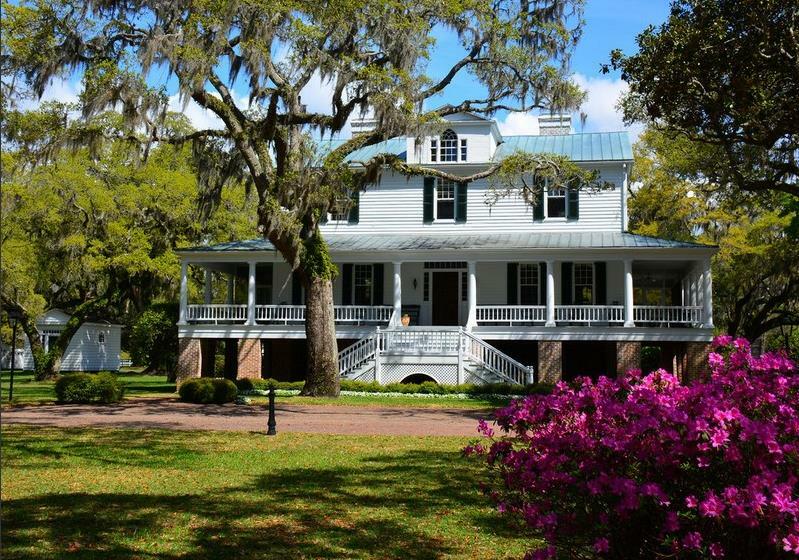 The plantation in its entirety is protected by a conservation easement with The Historic Charleston Foundation. Welcome to the entry hall. To the right of the entry is the drawing room. The doorways on either side of the fireplace are floor to ceiling and lead to the library. These two rooms share the fireplace. The drawing room is adjoined to the library sharing a double sided fireplace. Notice the doors again, aren't they amazing! The side yard view from the library. 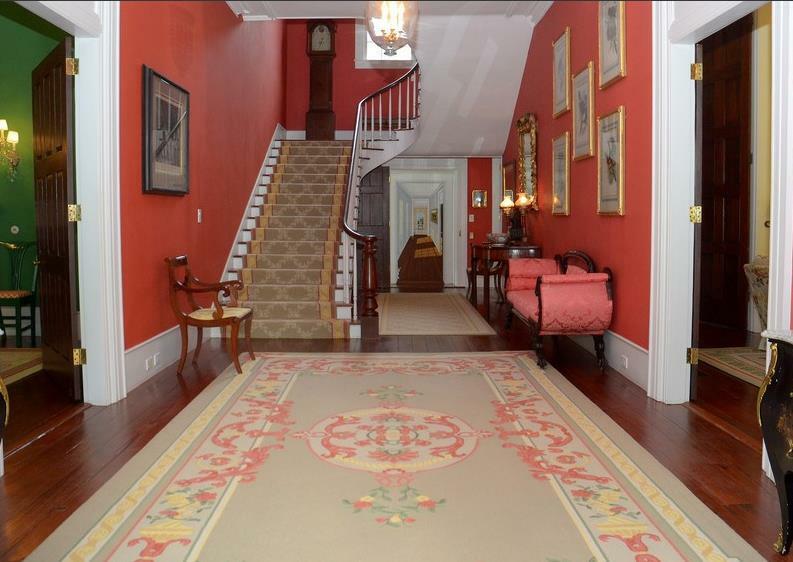 To the left of the entry is the formal dining room. Just behind the dining room is the kitchen. There are 10 bedrooms in this home! This bedroom is in the back extension of the house. Just across the hall from the bedroom is this living area. Here are more of the main house bedrooms. Beneath the house is the “winter” kitchen with original fireplace, mantle, bread oven and root cellar. At the back window and tucked around to the right of the cupboard is the bread oven. Below the house and just across from the winter kitchen is a guest room. There are many other buildings on the property. In this next picture you can see three of the buildings just to the left of the house. The original kitchen is closest to the house and is the one with windows around the doorway. The farthest building, back behind the kitchen, is being used as an art studio. The building to the left, just behind the live oak, is a charming place for guests to stay. A charming place for guests to stay. A couple of barns. I could live in one of them! This 10 bedroom, 8 full baths, 1 partial bath, 10,000 sq.ft,, 997 acre plantation can be yours for $13,475,000.00. Ahh, if only in my dreams! Hope you enjoyed the tour. 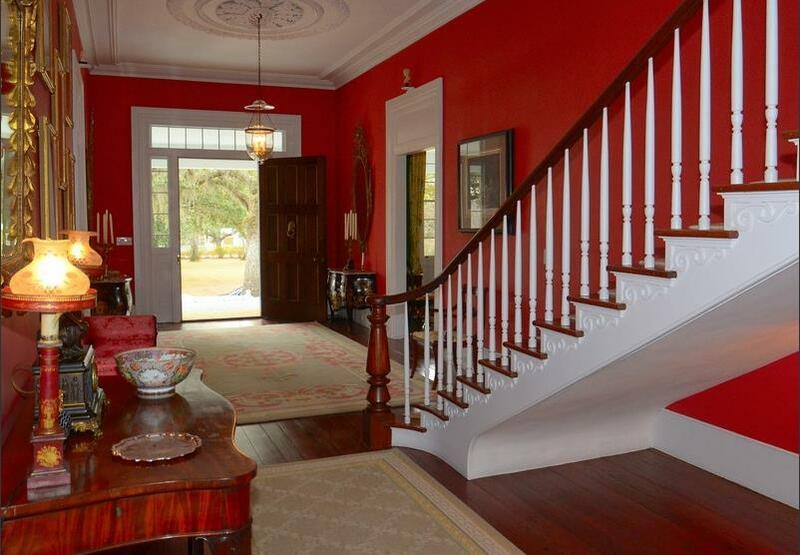 You can see more historic homes and plantation tour homes here. Join us each week at 5:00pm Sunday for AMAZE ME MONDAY! Lovely home and lovely property. Can you imagine having so many rooms? Oh CIndy! This is absolutely outstanding, and in such wonderful condition! I could live in the lower level area, lol! I find all the rooms to be totally cheerful and inviting, just as they are decorated. Give me the staff that comes with the property and I'll be right there! Oh wait, I guess if I live in the lower level, that means I am staff! Thanks for sharing this beautiful piece of historical preservation. Wow, Cindy. Thanks for sharing. 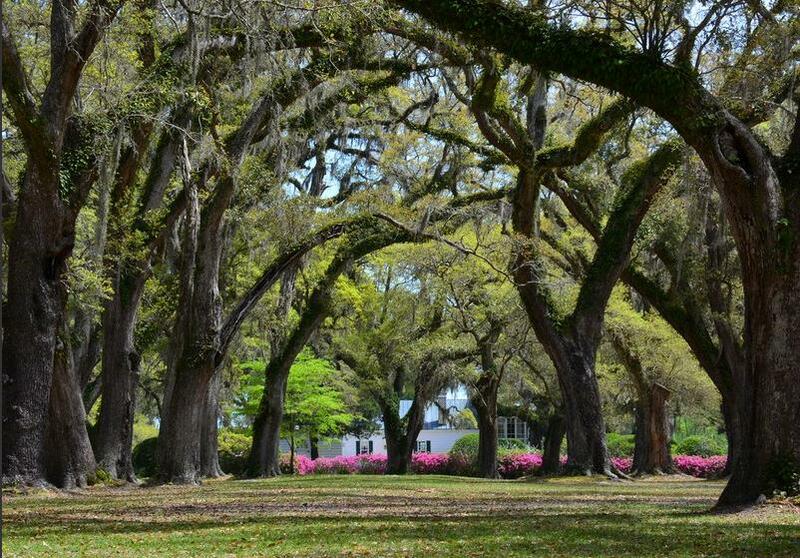 The live oaks and azaleas are enough to make me want to live there. I will be glaring at these photos for some time. Really gorgeous! I love those upstairs windows with the arches. Thanks for posting your plantation tour--probably the only way I'll ever get to see this estate. Thanks for sharing this majestic place Cindy!!!! Happy easter! Thanks for sharing these pictures with us. Don't I wish I could snap this right up! :) Have a good weekend and a blessed Easter. Wow, what a property! The house is beautiful but being the Victorian gal that I am, there would be a lot of changing going on to make the interior true to the period and the grandeur of the house. Thanks so much for sharing it all with us. Have a blessed Resurrection Sunday. I can't even imagine that one in my dreams, but it would be a very pleasant dream that's for sure! What an amazing place! STUNNING inside and out!! Happy Easter Cindy! Thanks for sharing the tour Cindy. What a beautiful property. Those live oaks and azaleas are just amazing. I just love touring old homes. Happy Easter. Spectacular! I love visiting old plantations in the South. So gracious and timeless. I never tire of them. Thank you so much for a wonderful tour. I am going right back to scroll through the pics again after I leave this comment. Fabulous! And I especially love the bright colors they've used to decorate. What a great time of the year to be there with all the azaleas and wisteria in bloom! stunning home and grounds! Thank you for showing it to us. Also, if you will look at the first few photos of the home and at the bottom of the two windows it looks as if there is some sort of latch at the bottom. i was curious as to why this would be? thanks so much for all you do! This historic plantation is really amazing! My ancestors settled along the Little Pee Dee River when they immigrated from Europe to South Carolina as French Hugenots! Would love to visit this beautiful home sometime! Hope it stays open to the public! Thank you for you post of it! I could live out on the porch forever...the view of the river...the lazy summer afternoons...Heaven! This is my cousin Jamie Constance's plantation (1st cousin once removed). Living in Colorado I haven't gotten to visit it but hope someday I will. Thank you so much for the beautiful pictures! What a beautiful, beautiful home with such a rich history.